Welcome to Releasing Your Future! You are entitled to live a life full of happiness, health, wealth, love, friendship, true expression, and peace of mind; doing what you love doing. Do you really believe that? To find out how you can, pick up ‘Get Out of Your Own Way’ and turn to Section two – Releasing Your Future. 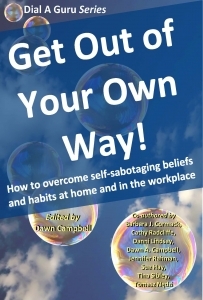 Releasing Your Future is a chapter in the co-authored book ‘Get Out of Your Own Way’. co-authored with Cathy Radcliffe, Danielle Lindsay, Dawn Ann Campbell, Jennifer Rahman, Susan Hay, Tina Sibley, and Tomasz Nedzi. in your copy of Get Out of Your Own Way!